He really just likes to liven things up at school -- and he's always had plenty of great ideas. When Nick learns some interesting information about how words are created, suddenly he's got the inspiration for his best plan ever...the frindle. Who says a pen has to be called a pen? Why not call it a frindle? Things begin innocently enough as Nick gets his friends to use the new word. Then other people in town start saying frindle. Soon the school is in an uproar, and Nick has become a local hero. His teacher wants Nick to put an end to all this nonsense, but the funny thing is frindle doesn't belong to Nick anymore. The new word is spreading across the country, and there's nothing Nick can do to stop it. 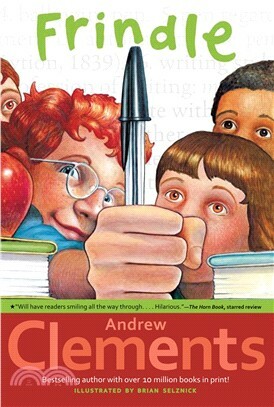 Andrew Clements is the author of the enormously popular Frindle. More than 10 million copies of his books have been sold, and he has been nominated for a multitude of state awards,?including two Christopher Awards and an Edgar Award. His popular works include About Average, Troublemaker, Extra Credit, Lost and Found, No Talking, Room One, Lunch Money, and more. He is also the author of the Benjamin Pratt & the Keepers of the School series. He lives with his wife in Maine and has four grown children. Visit him at AndrewClements.com. my school teachers assigned this little book as a winter vacation homework, and i really like this story. the plot is imaginative and creative. besides the interesting story, i think everybody can learn something from the book, no matter you're a kid or an adult.